Lane Tech alumni, you got my attention. You see, A Chicago Sojourn is a quiet little blog, highly specialized, written for a niche audience that’s pretty tiny. On a typical day, I get 100 to 300 page views. My best day ever, since moving to WordPress 18 months ago, was about 1,100 page views. This week, y’all smashed that but good. Twice over and then some. I don’t know through what channels my Lane Tech post from 2011 is getting bounced around, but clearly it struck a chord with lots of alums. 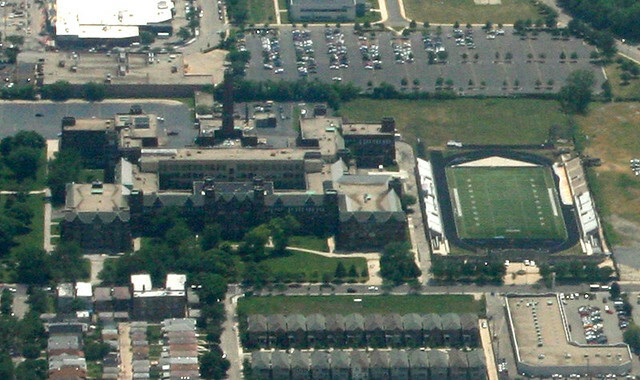 I love big numbers as much as the next blogger… so by way of thanks, here’s a second look at Chicago’s biggest high school. Hopefully you’ll enjoy this outsider’s look at your alma mater. Maybe it will even let you see from a new perspective… literally! If you’re flying into Chicago on a clear day and you get lucky, your flight’s approach to O’Hare airport will take you over the city’s northern reaches. 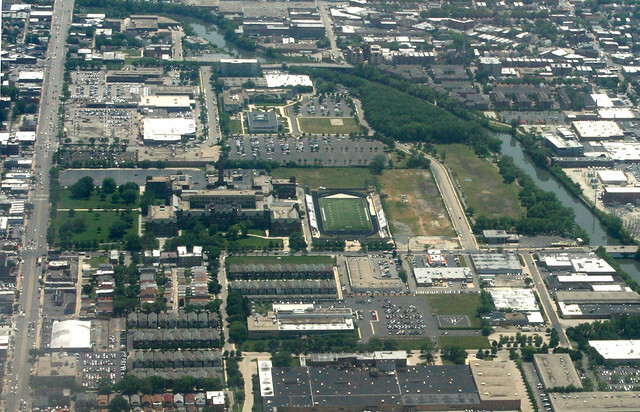 The flight line is roughly aligned with Bryn Mawr Avenue, so if you’re on the left side of the plane you’ll get a sweeping view of the north side, including Lane Tech’s expansive campus. It’s about two miles away, though, so if you really want a close look, you’ll need binoculars. Or a good zoom lens. 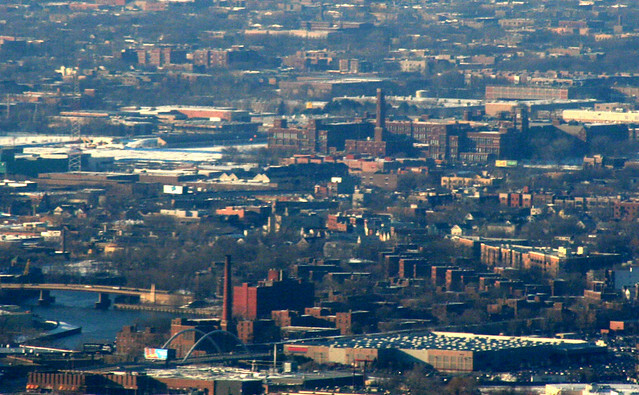 Likewise for the view from the other direction – looking north from the Sears Tower. I haven’t been back to the school’s campus since my original visit, but I usually shoot lots more than I post, so I always have at least a few shots in reserve. Likewise, I didn’t do much research last time; this time I’ll dig a little deeper into the school’s history. 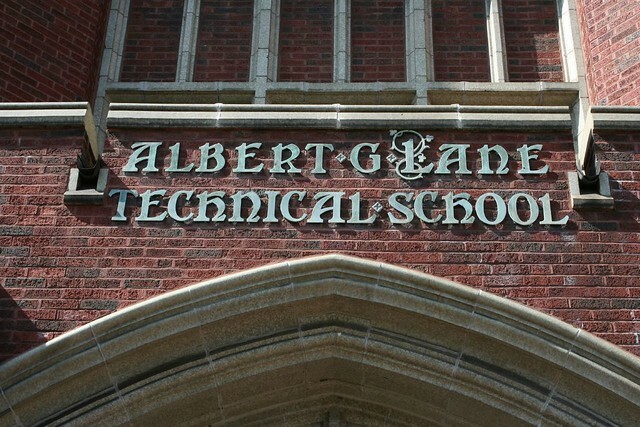 Lane Tech is named for Albert Grannis Lane, superintendent of Chicago schools from 1891 to 1898. 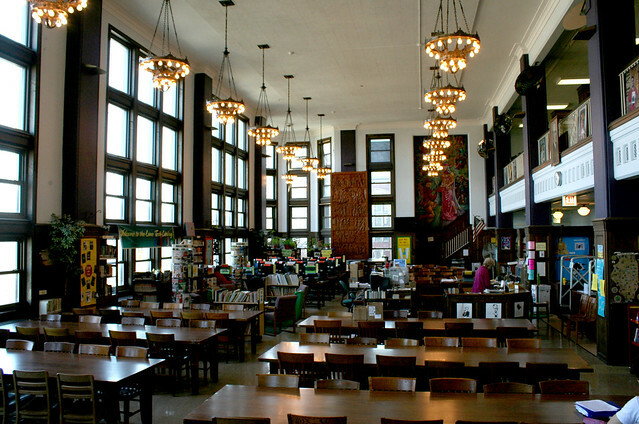 Originally opened in 1908, Lane was soon moved into a new 1912 building at Division and Sedgewick. 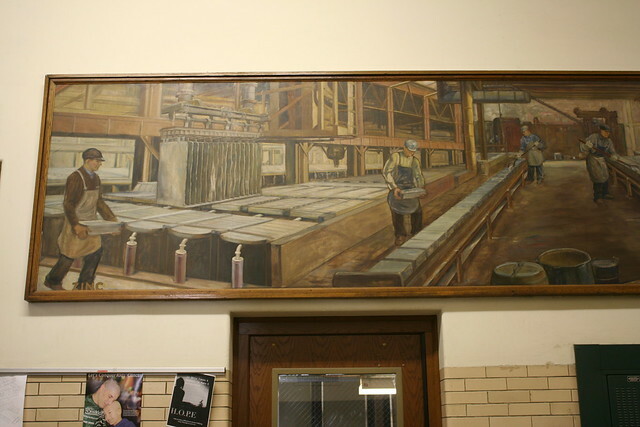 Faced with the great demand for industrial training, the building was soon overcrowded beyond reason, and plans for a replacement began in 1926. 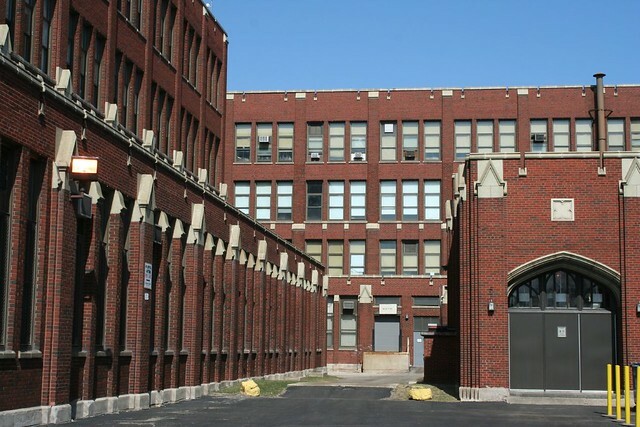 Once Lane moved out in 1934, the old building would be occupied by Washburne Trade School until 1958, then became Edwin G. Cooley High School, serving students from the nearby Cabrini-Green housing projects (and documented in the 1975 film Cooley High). Cooley closed in 1979 and was demolished sometime thereafter. The new building’s planning and construction were long and drawn out. 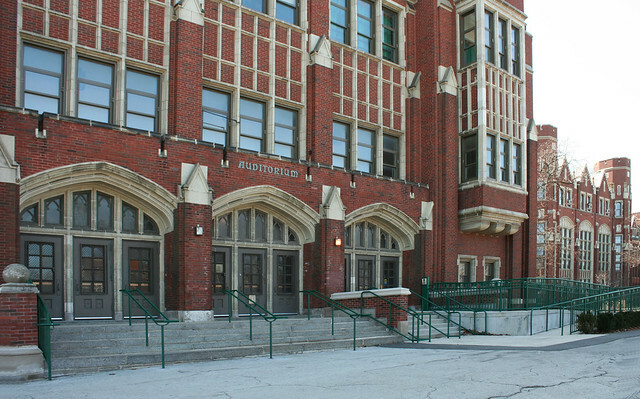 The School Board first began eyeing the land – previously a golf course and a brickyard – in 1926; the option of buying out nearby Riverview Park was rejected as too expensive. Architect John Christensen drew up plans which then sat idle for several years; foundation work began in 1930 but halted due to Depression-fueled funding problems. Construction sputtered along into 1931, with most walls going up, only to halt again due to money issues. Some creative financing by Mayor Kelly got building moving again in 1933. After two more years of construction, and a total cost of $6 million, the new structure was ready to receive its 7000 students. 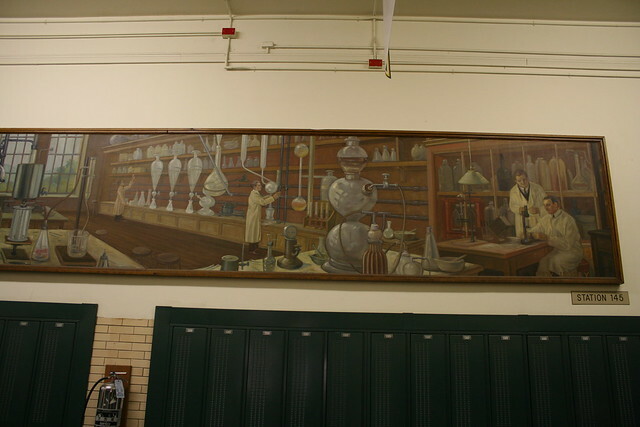 The Albert G. Lane Technical School opened its new building on September 17, 1934. The event was heralded by an effusive article in the Chicago Tribune. 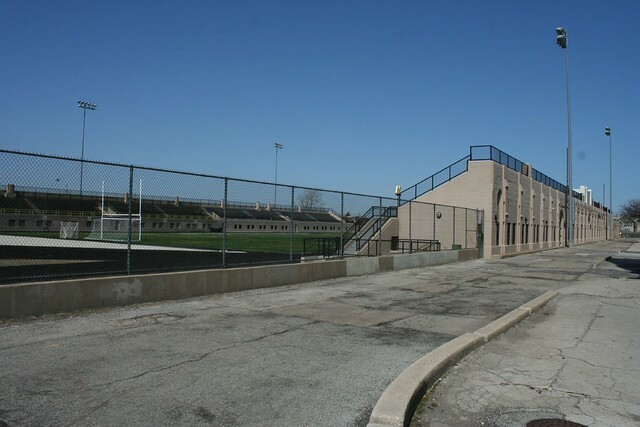 On the opening day, some 6,000 students – all boys – marched from Wrigley Field to their new educational home, and were addressed by Mayor Kelly on the athletic fields. The curriculum on opening day included a huge range of skills and training programs – from stone cutting to automotive repair and engineering. 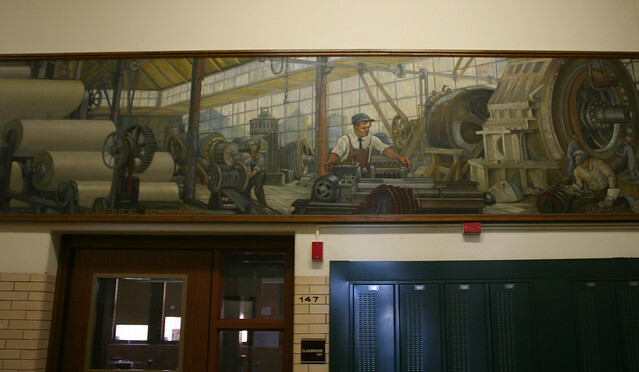 Dozens of labs, studios and workshops augmented the school’s classrooms, including an aviation shop with “sliding doors sufficiently wide to admit an ordinary airplane” as well as facilities for welding, forging & foundary work, and machine and motor testing. 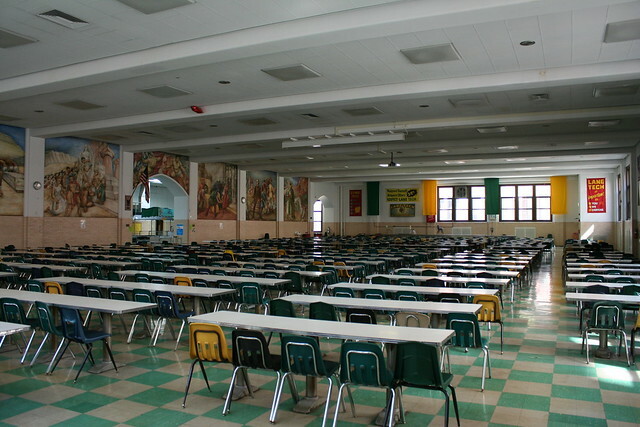 The superintendent of schools noted that the sectionalized coursework meant that students would leave Lane having learned something useful and adaptable to the job market – “no matter when they drop out”. Different times, indeed! The legacy of that time still stands, greatly changed but still fulfilling its original mission. The focus on manual and technical training has been replaced with a more modern range of subjects, including a STEM focus; the student body is now highly diverse, including many children of recent immigrants. 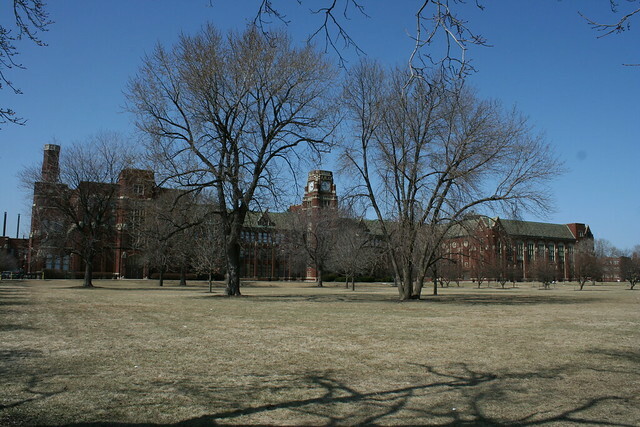 Lane remained a boys-only school until 1972, when the first girls were admitted. The student body initially protested this break with tradition, with some 1,500 boys marching outside the school board building chanting “We don’t want no broads!” “Why are the girls coming to Lane? Because not being admitted violates their rights?” wrote one Tribune reader. “What about all of the boys whose programs will be curtailed? What about their rights?” Despite the trauma surrounding the idea, the school rather calmly went co-ed in 1972, one of the last in the city to do so. The Tribune recorded one anonymous student’s reaction: “We don’t mind girls in school here if they look pretty. We could do without the ugly ones.” Different times indeed! 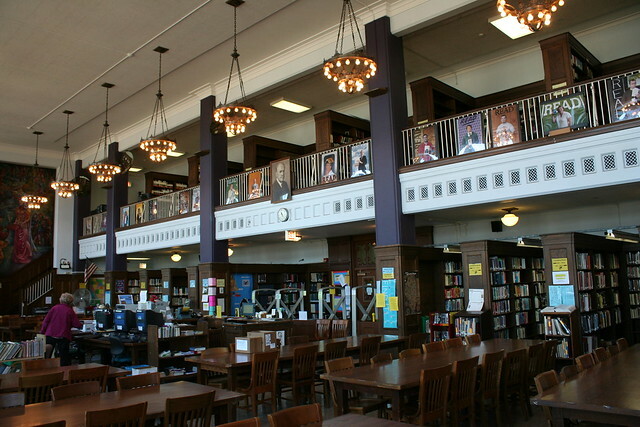 Above: the exquisite library, the finest space of those I was able to visit. 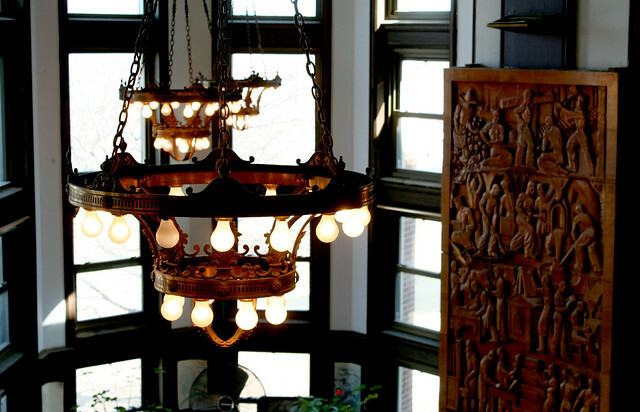 The lamps are especially beautiful in their detailing. 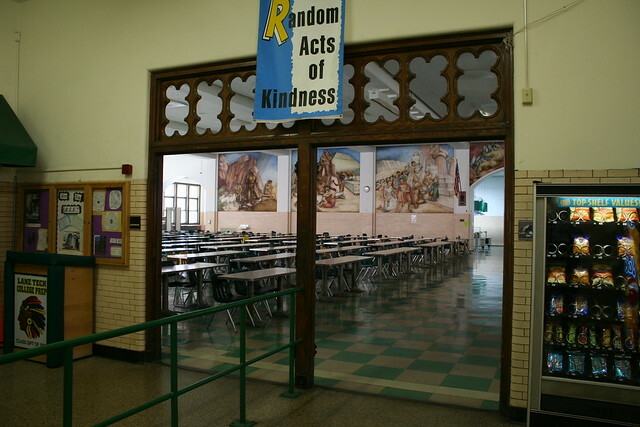 Below: the cafeteria, whose main attraction is a multi-paneled mural. It also has Gothic tracery in wood over the main entrance… a sharp contrast with the green-and-beige floor tile which looks like it walked straight out of 1959. 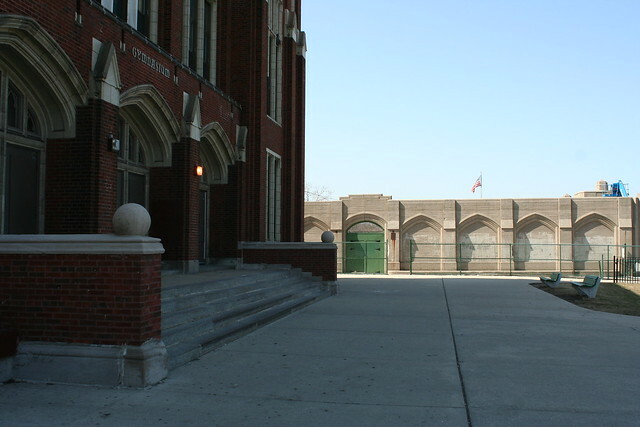 One thing that made Lane Tech so interesting to me was just how much it retains traces of the eras through which it has passed. The interior finishes span a range of ages – from original brick to Mid-Century floors and more. 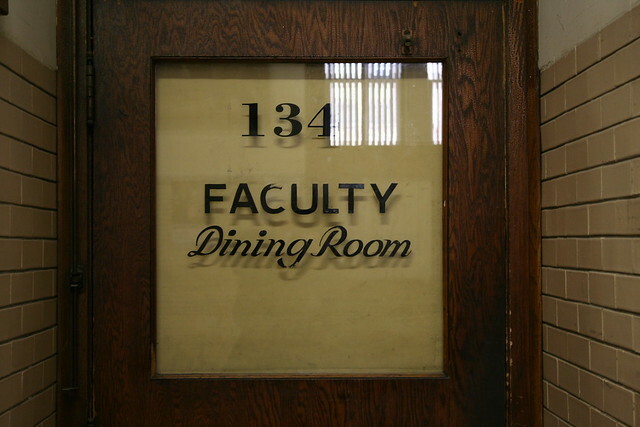 Incidental signs from many decades could be found, from the painted glass letters of the Faculty Dining Room to a simple, elegant Men’s Room sign, clearly dating from a long-vanished time. And of course, there’s those wonderful World’s Fair murals. I could do a whole blog post just about them. One commenter noted that I had not covered the stadium – a fair question. Truth be told, I wasn’t too happy with any of my shots of it; and to my dismay, I never photographed the front facade, which faces northward onto Addison Street. It’s a peculiar structure, a horseshoe open to the south. The bleachers are permanent, built of limestone carved into Gothic forms, but they’re not especially big or towering compared to their length. In fact the whole thing looks like the base level of a gargantuan Gothic cathedral that never made it past the first story. 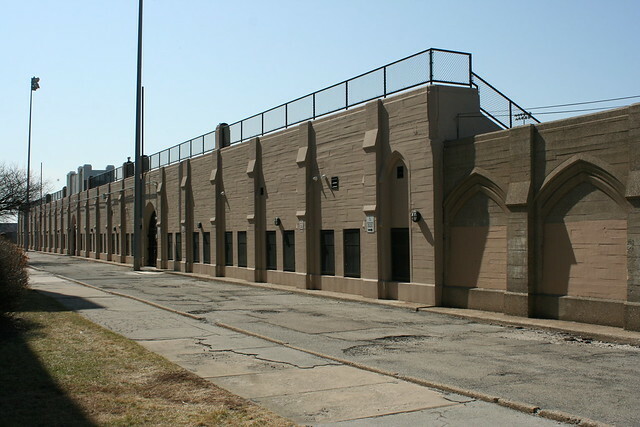 Planning for the stadium began in 1939, and it was dedicated in 1942. Built by WPA labor, the 5,000 seat stadium conceals a number of team, training and locker rooms under its stands. The dedication was combined with a music festival to make a rather elaborate and extensive event. 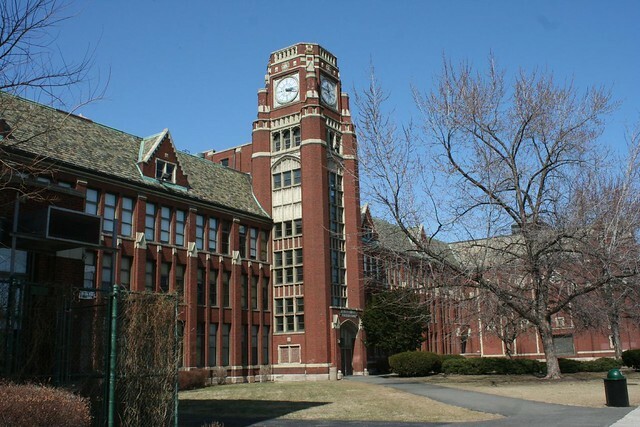 And since I’ve maybe got the attention of a few alumni – did anybody ever make it up into that big clock tower? It is a fascinating structure. Younger me – and present-day me, too – would have jumped at the chance to sneak inside that thing, especially to see what remains of the clock mechanisms. 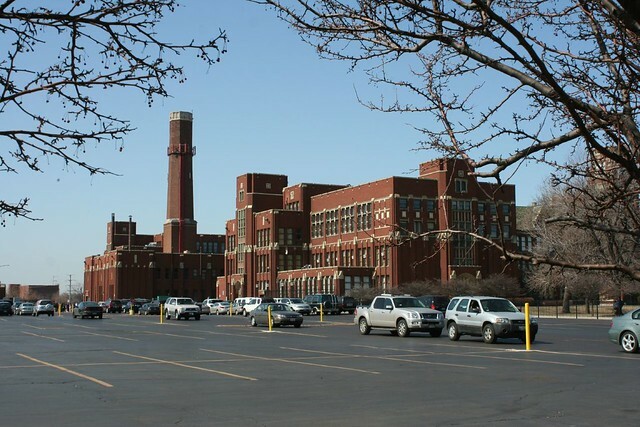 From the blog Chicago Historic Schools, a more comprehensive history, including a shot of the original building at Division and Sedgwick, now lost. This entry was posted in Aerial Photography & Views from High Places, Meta, Period Revival Styles. Bookmark the permalink. I’m a grad from 1974 (proud to say I was #2 in my class.) Be fearless and bold for the myrtle and the gold! I remember all these elements of LT very well. My father’s former employer was a graduate of Lane Tech. A brilliant man with many accomplishments. He went on to become one of the largest home builders in Chicagoland with my dad as his right arm man and liaison to the city. My father severed as the President of the Home Builders Assoc. of Chicago during the 1960’s. 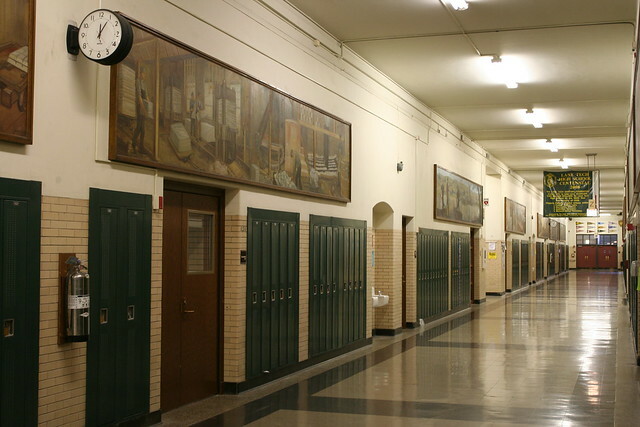 My father was scheduled to go Lane Tech but chose his neighborhood high school, Manley on the west side, after finding out that there were no girls at Lane Tech. 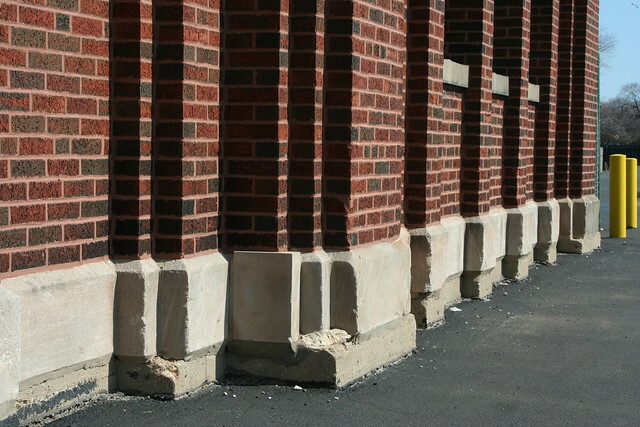 My father and I often share your blog as we love Chicago architecture and the history. I meant to write…my father served.. not severed. oops! Debra – thank you for the kind words! I would be very interested to learn more about your father’s work. Is there a way to reach you directly? Great blog. Thanks. 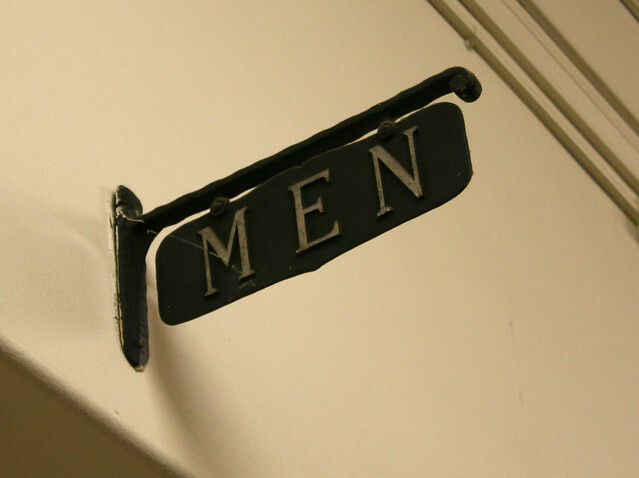 I am pretty sure the men’s room sign was made at the school. It looks like the aluminum castings made in the school’s foundry shops. I, along about 150 of my classmates, just attended our 50-class reunion and we were given an opportunity to tour the building. When I was there I took Horticulture, and had an opportunity to assist in the planting of the garden that occupies the center courtyard of the building. I was somewhat disappointed that the garden did not seem to be as well maintained as it was when I was there. The other thing that saddened me is that all of the shops are gone. Although not ever in any of the trades I have used more of the skills that I learned in those shop classes than I have in any of my academic classes. It is a significant space to be in and I think that it inspired many of those who passed thru its halls. 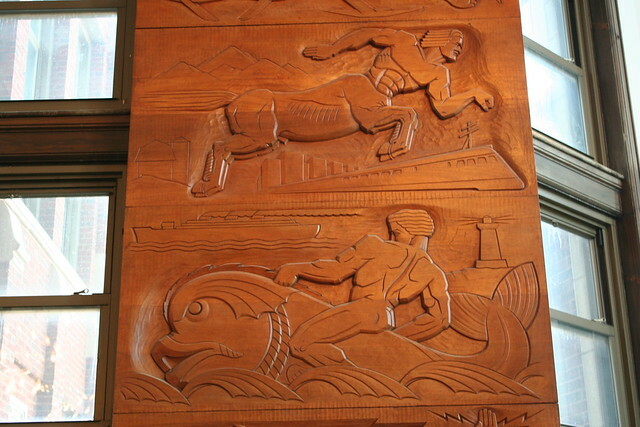 I am glad to see that you captured some of the WPA art work that is such a significant part of the of the building and of Chicago and its working people.